This headband style your hair! Cord is worked in a tubular way but it can be worked in i-cord method. 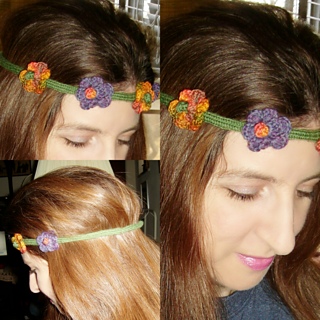 It is adorned with crocheted flowers placed about two inch between each other. SIZE Fits most adults women and even little ones, it depends in the tension of elastic. Yarn Knit Picks (75% superwash wool, 25% nylon; 231 yd): # 24589 Forest Heatheer, 1 ball (A). Knit Picks (75% superwash wool, 25% nylon; 231 yd): # 24595 Sprinkle Heatheer, 1 ball (B). Koigu (100% merino wool; 175 yd): # P91331 Hand-painted Palette Premium, 1 ball (C).